Orient can't be playing for another trip to Vegas, can they? Sigh. We see this a bit too much. Photo: BBC. So. All of a sudden, everyone is hurt again. Suddenly, it feels like rotation isn't much of a question for this cup tie, since so many of the starting XI can't play anyway. Robin van Persie hurt his knee scoring on Sunday and will miss at least three weeks; Laurent Koscielny has a tight hamstring and will be rested. Cesc Fabregas could return for next week's trip to Barcelona, but Theo Walcott will not. Alex Song also picked up a knock to his knee on Sunday and will not be available. Arsene Wenger mentioned yesterday that Manuel Almunia will start in goal as Wojciech Szczesny will get a bit of a rest (I'm scared too.) 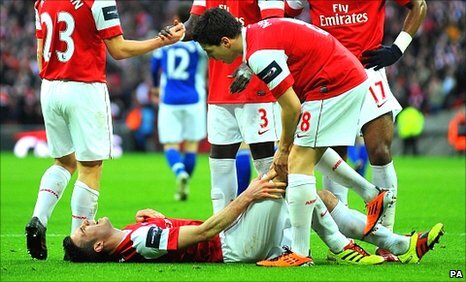 On the back line, Koscielny's injury means that Sebastien Squillaci will return to the side. Given the necessity of winning, I would hope Johan Djourou gets a start. On the sides, it's never really a shock to see Emmanuel Eboue and/or Kieran Gibbs get a run out, though again, with the necessity of winning, I would be concerned about wholesale changes. With Alex Song out, Abou Diaby has a good chance to get a start. He was not on the bench on Sunday, having just recovered from a calf injury suffered while on international duty, something that flew under the radar given his recent three match domestic ban. Aaron Ramsey has technically been recalled from his loan spell (at least, as I'm typing this,) but would be ineligible since he was on loan at Cardiff City at the time of the original cup tie. I expect to see Denilson start and Jack Wilshere rested, though I'm not thrilled about that. With so much of the attacking force out injured, my hope is that Wenger will start Samir Nasri in the middle. Andrei Arshavin will start on the left wing, while I have the feeling the great "Nicklas Bendtner on the wing" experiment will continue on the right side with Marouane Chamakh up top. I find that there should be no room for out-of-form Tomas Rosicky. This is a big match for Arsenal, not just for advancing in the FA Cup, but for burying the memories of Sunday's shocking finish as quickly as possible. Jonathan Tehoue, who scored Orient's late equalizer in the original tie, missed the second half at the weekend with a migraine, but is expected to return to the side for this match. Harry Kane saw yellow cards twice at the weekend, and as such, serves a one match ban. Steve Dawson (knee), Matthew Spring (calf) and this weekend's equalizer-scoring hero Jimmy Smith (hamstring) are injury doubts. Leyton Orient sit 53 places behind Arsenal in the league standings; they are notably now the lowest remaining team in the FA Cup. the weekend. Photo: Sky Sports. The loss at Wembley on Sunday snapped Arsenal's 11-match unbeaten run, but if you exclude the Carling Cup, Arsenal are unbeaten in 16 matches across the three competitions in which they are still competing. Incidentally, that streak dates back to the 1-0 loss at Old Trafford on December 13, and a win in this match will seal another trip to Manchester for the FA Cup Quarter-Final on March 12. At home, Arsenal are unbeaten in 13 matches and have won seven straight at the Emirates. 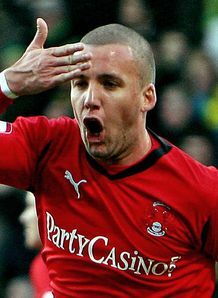 Leyton Orient are in brilliant form in 2011 and have not lost since a 5-0 set-back on New Year's Day, against League One leading Brighton & Hove Albion. Orient fell behind 2-0 at the weekend at Huddersfield Town, pulled a goal back, had a man (Harry Kane) sent off, then got an equalizer from Jimmy Smith in the 88th minute to steal a point and keep their unbeaten run alive. Arsenal's draw with Leyton Orient during the original cup tie was the first time they failed to beat the O's in six meetings since World War I. Arsenal had also won all four prior FA Cup ties without requiring a replay. They have also never lost an FA Cup tie to a lower tier side under Arsene Wenger. You would have to go back to 1992 and Wrexham to find the last team from outside of the top two flights to knock Arsenal out of this competition. Leyton Orient has only spent one season in the top flight of English football: 1962/63. In that year, Arsenal beat them twice, 2-1 at Brisbane Road and 2-0 at Highbury. Orient's last win over Arsenal came in the old second division, on February 13, 1915. The referee is Lancashire-based Lee Mason, who you may recall had a terrible match at the Emirates in January during Arsenal's 2-1 win over Everton. Mason controversially allowed Louis Saha's opening goal of the match, thanks to an exceedingly large gray area in the offside rule's interpretation. Mason also showed eight yellow cards in that match, three of which were to Arsenal players. Despite the disappointment of this past weekend, Arsenal managed to get major help in their pursuit of the league crown, as Chelsea defeated Manchester United 2-1 at Stamford Bridge yesterday. Arsenal remains four points behind United for first place, but now have a game in hand, and with a meeting against the Red Devils scheduled for May 1 at the Emirates still on the table. This means for the first time this year, Arsenal controls their own destiny. There's still a lot of games to be played (11, to be exact,) but if Arsenal takes care of their own business, they'll win the league. No more needing outside help required. In the FA Cup, Everton were bounced by Reading 1-0 yesterday, while Manchester City hosts Aston Villa today. Arsenal's match is the only replay being played, since Everton and City are basically half of a round behind.